Left to right: Daniel T. Parker, Rodney Gardiner, David Kelly. Photo courtesy Oregon Shakespeare Festival. 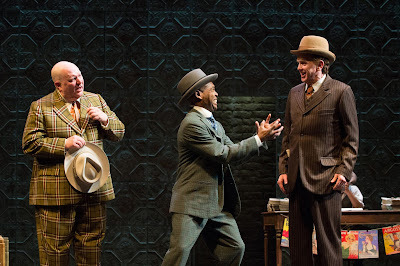 Loesser, Swerling, and Burrows’ classic musical Guys and Dolls has a lot going for it even before it hits the stage: A toe-tapping score, well-developed characters taken from the Manhattan of Damon Runyon, and clever lyrics. However, OSF has elevated this Broadway standard even further through the direction of Mary Zimmerman. 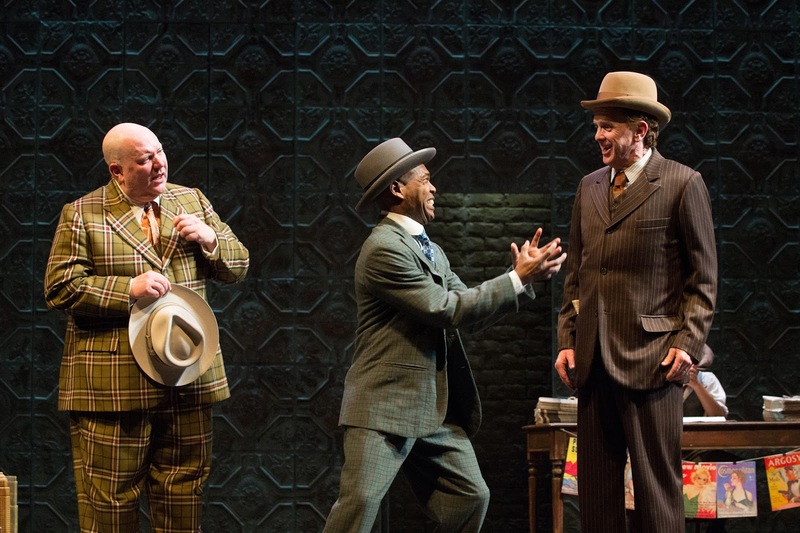 Zimmerman’ s techniques of representational fantasy, known at OSF for 2013’s transcendent White Snake, makes Guys and Dolls the best show of the season and one of the best OSF musicals in recent memory. Most of the action in Guys and Dolls takes place on a nearly empty stage, save for the occasional prop: A movable storefront and benches for the Save-A-Soul Mission or a rain of beach balls for Havana. This allows the play to have fun with space through light and motion, changing the vast space of the Angus Bowmer into a cramped room by lowering a single light and moving some furniture. The backdrop is cast in a dark green light and painted to look like tile carvings in a train station, giving a feeling of city life without being too specific where in the city it is. The ensemble cast is hilarious to a tee. Jeremy Peter Johnson plays the ever-smooth Sky Masterson, intent on winning a bet by taking prohibitionist Sarah Brown (Kate Hurster) to Cuba. As his heart gradually opens over the course of the play, Johnson’s carefree manner becomes replaced by a palpable regret, but he never loses the flair at the core of his character. Hurster plays Sarah Brown with a sense of strength and integrity: Even when she’s backed into a corner, she stands up and takes responsibility, never placing her fate in someone else’s hands. My personal favorite character in Guys and Dolls, however, was Rodney Gardiner’s Nathan Detroit. Gardiner lends a nervous energy to the role that makes the escalating situation of his floating craps game even funnier. His unlikely friendship with Sky only serves to bring out their contrasting personalities even further, as Sky largely succeeds at what he sets out to do while Detroit flounders deeper into trouble. While Sky is the textbook definition of a hero, Gardiner’s Nathan Detroit is a character with which the audience can identify. Guys and Dolls is true theatrical magic, combining beautifully choreographed dance numbers and a script with a heart of gold. Mary Zimmerman’s rendition draws from her storytelling experience without turning the show into a fairy tale, and the acting company performs at the top of their game. Though you could see this musical in many places, I doubt you’d find any performance quite like the one at Oregon Shakespeare Festival.